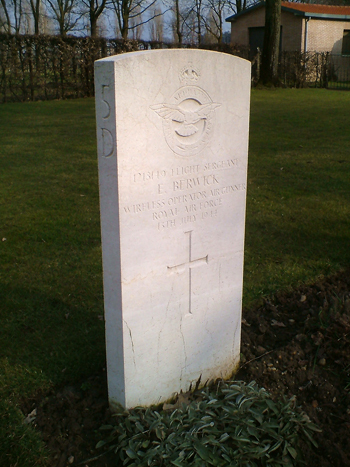 Flight Sergeant Edward Berwick, 1218149, RAF Volunteer Reserve. Wireless Operator and Airgunner. 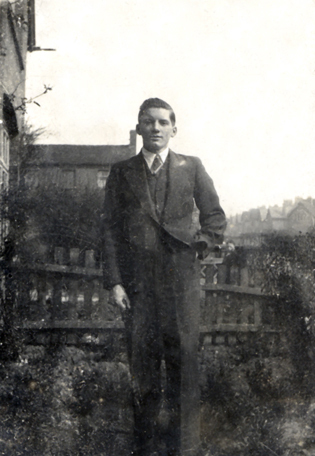 Edward standing in the front garden of his parents house at 230 West Bromwich Road. Edward Berwick died on his 22nd birthday, 13th July 1944, a long, long way from his home at 230 West Bromwich Road, Walsall. Edward, who was the eldest son of Edward senior and Sarah Berwick, volunteered for the RAF in February 1940 and was called up in August of that year. A year after joining he won his wings as a wireless operator and airgunner. In 1942 he went out to Kenya and subsequently served in the Middle East, Sicily and Italy. At the time of his death he was on his second tour of operations. As a child he attended Palfrey Schools and was a prominent member of St. Matthew’s troop of Boy Scouts, serving for a short time as a scoutmaster as well as being a member of the ATC (Air Training Corp). On leaving school he was employed as an engraver by F. H. Reckless & Sons Limited of Bridge Street. A memorial service for Edward was held at St. Matthew’s Church on Saturday 25th October 1944. Thursday 13th July 1944 was a glorious day in southern Italy, at the Regina Air Base a few miles out of Foggia the aircrews of 142 Squadron readied themselves for the night’s mission. The aircraft, Wellington Mark X, were armed and like the crews, ready to go. In the remaining hours before take off the lads of 142 gave one of their number, Edward Berwick, a rousing twenty-second birthday, well, as rousing as circumstances would permit, the drinking would have to wait until the following day! After the briefing they knew where they were heading, all 89 aircraft of 205 Group of the RAF were going north to bomb the railway marshalling yards at Milan-Lambrate. As the group headed north after take-off, the dark clear skies of southern Italy were a distant memory as they flew into cloud and rain, the further north they went the worse it became. Nearing the target, as well as poor weather to contend with the aircraft came under heavy anti-aircraft artillery fire from the ground. 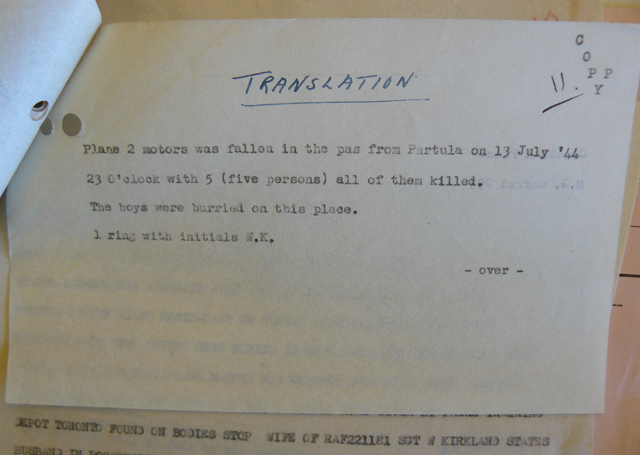 On the ground the air-raid alarms went off at 23.32 hours and the all clear sounded at 0.13 hours. During that 41 minutes several aircraft were hit by flak including the Wellington Mk. X, HE 293, Edward and crew mates were in. Six of the seventy-four Wellington Mk. Xs in the raid crashed on or around the target area. 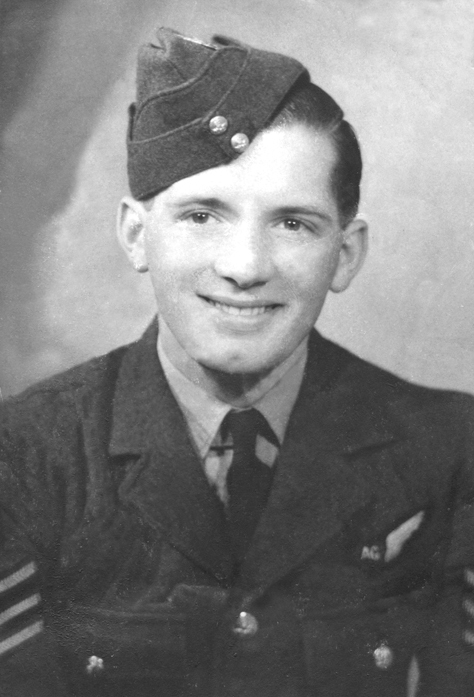 The pilot of HE293, Kenneth Arthur Fairclough attempted to guide his stricken aircraft in the direction of the Swiss border as he knew he had no chance of making it back to Regina air base due to the damage sustained and the now appalling weather. A stricken aircraft, appalling weather and the Alps to negotiate, the odds were most certainly against HE293. 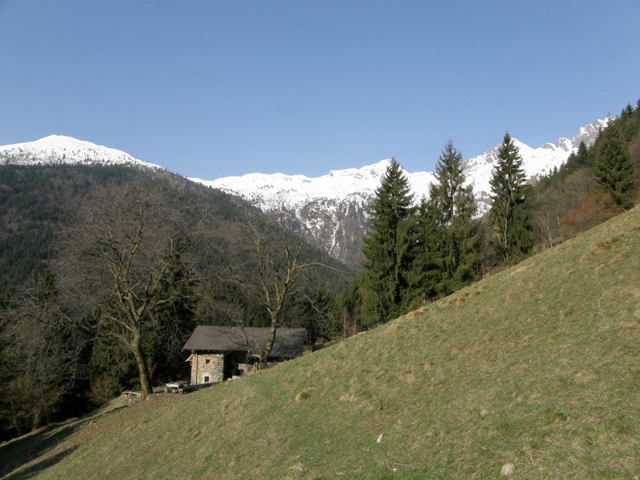 In the early hours HE293 could not maintain altitude and crashed into mountains at a point known as Passo della Portula near Bergamo and around 50 km north east of their target at Milan. The crew were the pilot, Flight Sgt. Kenneth Arthur Fairclough (1339199), the navigator, Canadian Pilot Officer Ernest Albert Wesley Dawson (J/88669), the airgunner, Sgt. William Kirkland (2211818), Flight Sgt., George Earl Smith (R/163668), another Canadian and bomb aimer and finally Edward. All five are buried in the Milan War Cemetery. Edward’s family were under the impression that the aircraft crashed into the Mediterranean Sea and no bodies were found, this we now know to be untrue. In May 2012 I was contacted through Ancestry.co.uk by Sergio Inzoli of Lodi, a town south of Milan. He researches WW2 crashed aircraft sites and was very keen to impress on me he was only an “amateur researcher”, if that is the case it makes me wonder how good a professional researcher in the same field would be! His research is excellent. Sergio told me that although HE293 crashed in a remote place the shepherds working in the area were first on the scene the following morning along with a group of partisans. In the vicinity was a visiting priest, Rev. Geremia Pachini from Bergamo, who was told of the crash and climbed the mountain to the crash site with help from other villagers. Many people today remember this accident even though they were children then, Sergio Inzoli interviewed them and they confirm what happened that fateful day. The five bodies were buried close to where the plane came down thanks to Father Pachini who also contacted the British Secret Service in Switzerland and passed on details of the aircraft and its personnel. The aircraft itself was stripped of anything that was useful to the partisans and villagers and just the shell was left on the mountainside. Shortly after the war was over a group of British soldiers with mules arrived and climbed the mountain and brought the five bodies down on the mules. The bodies were then taken to the cemetery in Milan for burial. Keith Berwick, Edward’s nephew, visited his grave and those of the other crew members in March 2010 and took the photograph shown below. Edward’s grave in Milan War Cemetery. 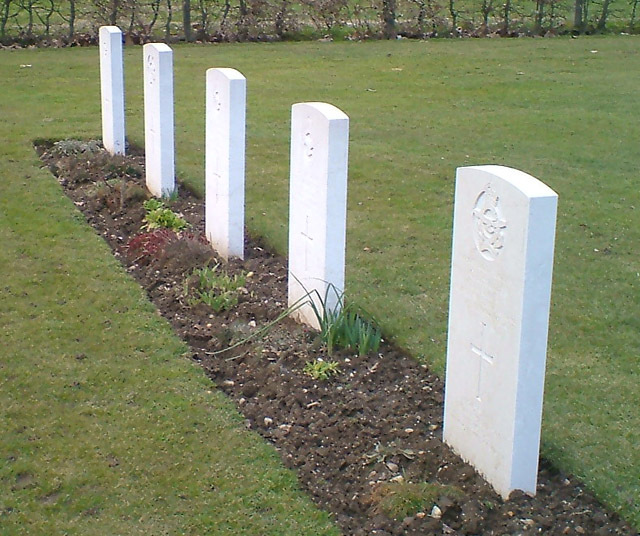 The graves of all five crewman who died together 70 years ago this coming July. A translation of the Italian document giving brief details, some of them wrong! The five unfortunate airmen at least had a Christian burial as Father Pachini, with help from the partisans, buried them as best they could in shallow graves. Although the Italian authorities at the time got many details wrong about the crash, they said it was an American aircraft and it crashed on 23rd July to point out two obvious errors. My thanks go to Sergio Inzoli, through his diligence and persistence he discovered all of this information and was kind enough to share it with me. I am very happy for your interest in the story of this guy who died near my town. Thank you Sergio for your interest, indebted to you for your excellent research. I am disappointed I could not help you regarding Sgt. William Kirkland, details of his early life are very difficult to find. You are currently reading Flight Sergeant Edward Berwick at Walsall Life.